So how do we help you reduce risk to see all of these interconnected results? You'll like the pie chart: 98 percent is our time. We just need your two cents to perform our proprietary, four-step Risk Management Audit. We are serious about being your out-sourced risk-management department. We work remotely and on-site at your workplace to improve your risk profile. The most distinctive part of our process... We're not salesmen or brokers. We act as consultants by bringing an unbiased, third-party set of eyes to identify risk exposures unique to your organization. Everyone has risk exposures, some are more severe than others. What’s important is that we are taking the time to identify the risk issues. To learn about the specific steps we follow during this phase of our risk management audit, please call us at 618-244-5800. Now that we have taken the time to identify and prioritize risks in Step 1, we start to develop strategies to mitigate the identified risks. No exposure to risk is off the table. If it can have a negative impact on your organization, we want to minimize the risk. We’re always around. We will be as involved in the implementation stage as we need to be. 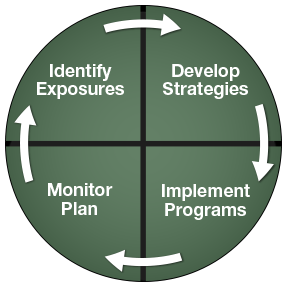 We provide the tools and resources necessary to put risk programs into place. Our consultants go through training to become Certified Risk Architects, which improves our ability to identify and mitigate risk across the board. This training consists of an intense 12-month program followed by an annual re-certification. The board for the Certified Risk Architect program consists of industry experts in Safety and Risk Management. The CRA program is extremely unique, only being offered to a select number of agencies across the United States. Our staff has also been through an OSHA 30-hour Occupational Safety and Health Training course in General Industry Safety and Health.